Much has been written about Esmond Romilly, husband of Decca Mitford, in books about the Mitford girls. A lot of it is hearsay, or formed from the unfavourable opinions of his sisters-in-law, and disapproving parents-in-law (Farve referred to him as ‘the BOY Romilly’). So, it is a treat that, for the first time in decades since it was released in 1934 and subsequently went out of print, Esmond’s voice can be heard. Co-authored with his older, equally brilliant, brother, Giles Romilly, the book was written following Esmond’s spell in a remand home. Rebellious and opinionated, the left-wing brothers shocked their Tory family (they were nephews-by-marriage of Winston Churchill) with their Communist views. Published when Esmond was sixteen and Giles eighteen, it is a memoir of their education, peppered with anecdotes about their eccentric home-life. Although it is a quick read, it is fascinating insight to young aristocrats who kicked against the establishment. 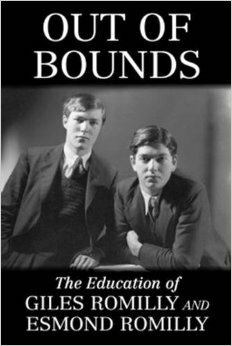 This re-issued version of Out of Bounds by Umbria Press includes an introduction by Giles’s son, Edmund Romilly. For more information on Esmond Romilly visit Meredith Whitford’s guest blog by clicking here. The supernatural was a fashionable topic of conversation in postwar society, with sophisticated hostesses sampling tarot cards, Ouija boards and table-tipping to provide an unforgettable party-trick. But, among those who dabbled in the unseen for paltry motives, there were serious followers of the occult. 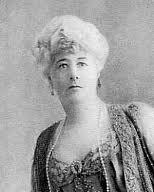 Violet Tweedale, the upper-class author, poet and spiritualist, chronicled her psychic experiences in her memoir Ghosts I Have Seen. She also belonged to the Hermetic Order of the Golden Dawn, an organisation devoted to the study and practice of the occult, metaphysics and paranormal activities during the late 18th and 19th centuries. 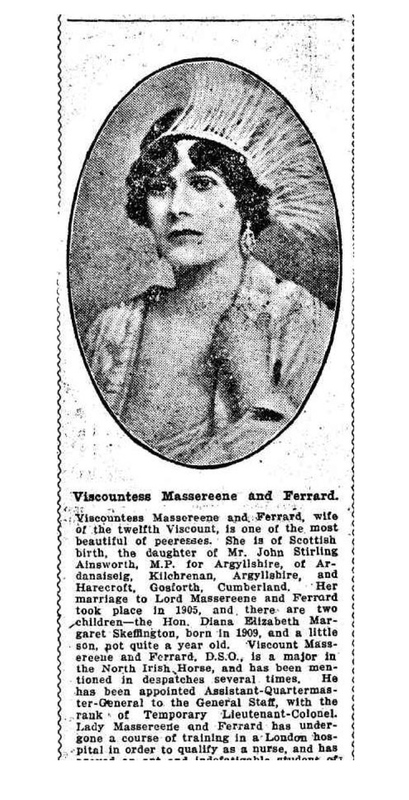 One of the most enthusiastic followers of Tweedale’s work was Jean Skeffington (née Ainsworth), the 12th Viscountess Massereene. Residing in her husband’s family seat, Antrim Castle in Northern Ireland, Lady Massereene thrived on the castle’s ghostly reputation and reported sightings of a servant girl – known by locals as “The White Lady” – and a phantom carriage which was said to recreate its calamitous drive down the estate’s lime tree avenue where it met a watery fate at the bottom of a long canal. A harmless fascination, but in the god-fearing market town of Antrim, her Ladyship’s interests were brushed off as eccentric. However, it was in London that Lady Massereene fully embraced her belief in the supernatural, prompting gossip columnists to refer to her as “one of Mayfair’s most renowned ghost experts”. Statements such as “This summer I vow to go to forty seances” were viewed as beyond the pale to those in possession of a level head. Her husband, the Viscount Massereene, expressed little tolerance to his wife’s eccentricities, and she challenged his patience – not to mention her reputation – when she summoned the police to Antrim Castle to report a missing tiara. The tiara in question, she told them, was lying on the bed of the Six Mile river. How did she know, her husband and the police, questioned. The response was a simple one: she had dreamt it. As much as Violet Tweedale and Lady Massereene spoke of their beliefs in the supernatural with genuine sincerity, there were false mediums springing up all over London as a response to the bereft individuals grieving their loved-ones lost to WWI. 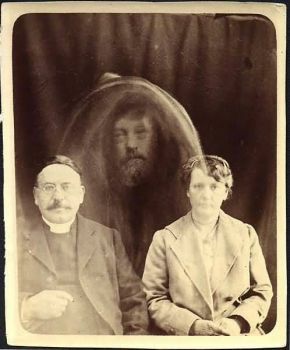 They say there is a market for everything, and this certainly rings true in the form of the medium William Hope and his invention of spirit photography. Taking a photograph of a client, he used glass plates and double exposure to make it look as though their dead loved-one was watching over them. Clever for its day, spirit photography serves as an example of the mass commercialism – or accessible commodity – that spiritualism had become. 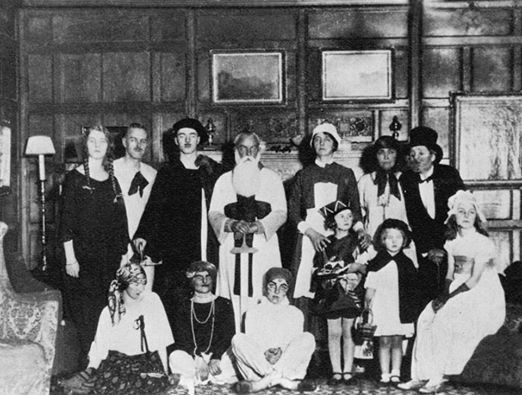 Away from London, in the sleepy Cotswolds village of Oxfordshire, the Mitfords were experiencing their own ghostly experience. Asthall Manor, the family’s gabled Jacobean home built around 1620 was said to be haunted by a poltergeist so active that it tore off a maid’s bedclothes. In the daytime hours, cutlery flew across the scullery, china cups and saucers were hurled from their shelves, water-taps turned on by themselves and windows flew open despite their being locked. 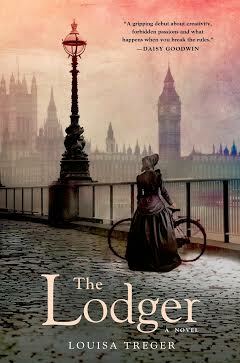 When night fell, footsteps could be heard on the paving stones outside, and on close inspection nobody could be seen. Could this have been the workings of the children’s overactive imaginations? Perhaps. The nursery windows overlooked the old graveyard of wool merchants’ graves, and although the children were forbidden to watch the funerals, they always did. Once, Decca and Debo fell into a newly dug grave, and Nancy warned them it meant “bad luck forever”. Debo carried the tale of the poltergeist with her throughout adulthood. A non-believer in such things, she flippantly dismissed it as “one of those nuisances that accompany teenage girls”, and was happy to be the instigator of ghostly pranks. Knowing of the ghost stories surrounding old, stately homes, she summoned her own make-shift ghoul to terrify some American guests who were staying at Lismore Castle. Mr. Twigg (sec. of the hunt) dressed up in a sheet, a night-cap, chains and carried a lantern. She fixed fishing-wire to the chandelier in the dining room and it shook and rattled, and then Mr. Twigg appeared through the windows. One American woman nearly fainted; she screamed and demanded to leave at once, to go anywhere, even to a hotel. “She was really horror-struck,” Debo recalled. “The joke nearly went too far.” Too far indeed, but Debo was one of the few in her family who did not believe in such things. Superstitions, too, governed Farve’s life to an extent that he would write the name of an enemy on a piece of paper, sometimes slotting it into a matchbox (a makeshift coffin?) and putting it away in a drawer. He believed the person who had vexed him would die within a year. Given that he often carried out this ritual on his many sons-in-law – Sir Oswald Mosley, Peter Rodd and Esmond Romilly, in particular – it is clear that his theory did not work. However, the very mention of “the drawer” was enough to send a chill through the room. 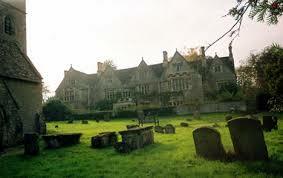 After ten years of living at Asthall Manor, the house was promptly put on the market. The family vacated the haunted house for temporary lodgings in Paris. Although financial difficulties inspired his decision to sell the house, the family believe the poltergeist played a significant part. For a sensible, philistine man like Farve, the very mention of a ghost turned his blood cold. Could there have been more than a hint of idle gossip in the existence of the poltergeist? His offspring seemed to think so.